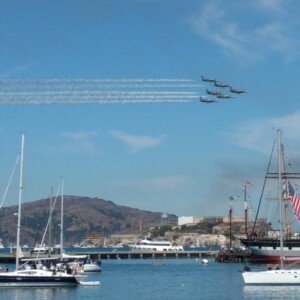 Fleet Week San Francisco, the annual spectacular event where armed forced come together to put on a show on sea and air. Expect to see skydivers, helicopters, and jets! Very loud jets. As can be described as must-be-there to experience, the only other place I've experienced a military jet is a flyby at AT&T Park for SF Giants game and hours of YouTube footage. The difference at Fleet Week is you experience the sounds, commentators, and group commotion. Plus, you can get some nice photos, especially if you have a high end camera and lens. Generally, anywhere you can see the Golden Gate Bridge and/or Alcatraz Island will offer you an amazing experience. But for a breakdown. Marina Green - You can buy tickets, but I'm sure there are parts of the Marina Green that aren't blocked off to ticket holders to experience the show. Buy tickets for a boat ride. Many boats will be sitting right on the water to experience the jets up close. Some offer food, but let's face it, we're here for the show. For Free at Aquatic Cove - There's concrete seating areas right near the museum behind the "beach", and a small grassy hill. They do set up sound systems near the Maritime Museum so visitors can hear the commentor and pilots. All areas here are free and first come first serve. People come and go throughout the air show, so you're almost certain to find a spot to sit. Pier 39 should offer decent views, but it's beginning to get farther away and Pier 39 is already a tourist trap without Fleet Week. A previous years, we did the boat tours and due to the long lines, we only made it as far as the Ferry Building. Though there were tons of people buying food and squating on seats outside in preparation to watch the air show, the view here were very poor. You can hear all the jet noise, but only expect to see small tail ends of actual aeronautic stunts. From there, check out 1 (possibly 2) boats depending on how early you arrive to SF. The lines do get long! When you're done, take Uber or Lyft (or a taxi) to your final destination (either Aquatic Cove or Marina Green). Reverse the steps to leave the city when the show is over, or check out some of other attractions San Francisco has to offer. If you drive, expect to pay hefty amounts at a parking garage or search for free 2 hour street parking. Free 2 hour street parking for Fleet Week will limit how much of the show you can catch. Though the air show schedule may change over time, I've noticed that the beginning of the show features skydivers and helicopters. Because the official viewing area is at Marina Greens, some of the viewing is not as clear. All of the skydivers land at Marina Green. This is where it depends on your preference. If you want to see the skydivers and helicopters, it'll be worth it to be at the Marina Green. However, if you're more interested in the jets, you can go an hour later and skip the skydiving and helicopters and start catching all the jet action. From there, both the Marina Green and the Aquatic Cove are appropriate.